Side-by-side refrigerators are a nice option for people who want to have plenty of storage space for both fresh and frozen foods, with easy access to items. They can also be ideal for kitchens where space is a consideration, as their doors require less clearance to swing open than a full-sized door on a traditional fridge, which has the freezer on top and fridge on the bottom. Finding the best side-by-side refrigerator for your home means reading reviews, studying product features, and diving into the ins and outs of available upgrades and refrigerator configurations. With the right side-by-side refrigerator, you can ensure that you have plenty of storage space for your perishable food, and that it will stay at a safe temperature. Rather have the freezer on the bottom? 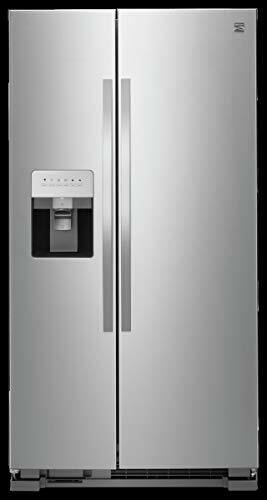 Check out our review of the best French door refrigerators. We reviewed dozens of side-by-side refrigerators to identify the best of the best, based on Amazon reviews, how well they performed in performance tests, cost, and other considerations. We narrowed our search down to 5 of the top-rated side-by-side refrigerators homeowners can purchase to ensure a their food stays cool and fresh. 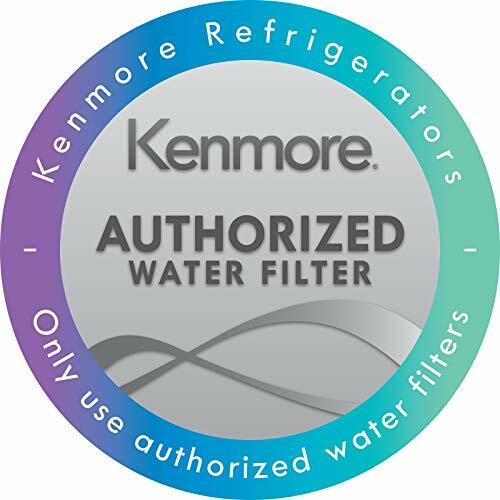 We’ve identified the Kenmore 50043 25 cu. ft. Side-by-Side Refrigerator as the best side-by-side refrigerator out there. With plenty of storage space and ample features, this side-by-side refrigerator is one that will keep your food fresh and accessible. These benefits allow you to prepare healthier meals in less time, and keep the foods you buy fresher for longer. The Kenmore 50043 25 cu. ft. Side-by-Side Refrigerator took the top spot on our list for the best side-by-side refrigerators as it comes with plenty of storage space – 25 cubic feet, to be exact — and also a host of features that families love. There is an in-door ice maker and water dispenser, and the tempered glass shelves can be adjusted to suit your needs. Gallon-sized adjustable door bins mean you can always have your favorite beverages at the ready, without taking up valuable shelf space. Those who purchased and reviewed this side-by-side refrigerator appreciated the ample storage space, although some mentioned it was difficult to get it set up to their needs. Some complaints mentioned that the ice maker was quite loud, which could be an issue for some families. With a price tag of approximately $1,200, it’s about middle of the road as far as the cost of side-by-side refrigerators go, but the quality craftsmanship associated with the brand, as well as the ease of setup and use more than justifies that price. It has a rating of 3.7 on Amazon with more than 50 people reviewing it, which we think goes a long way in convincing homeowners to make the investment. The Kenmore Elite 51823 21.9 cu. ft. Side-by-Side Refrigerator took the runner-up spot on our list of the best side-by-side refrigerators, because although it is still a quality choice, it offers less storage capacity — 21.0 cubic feet — than our top pick. 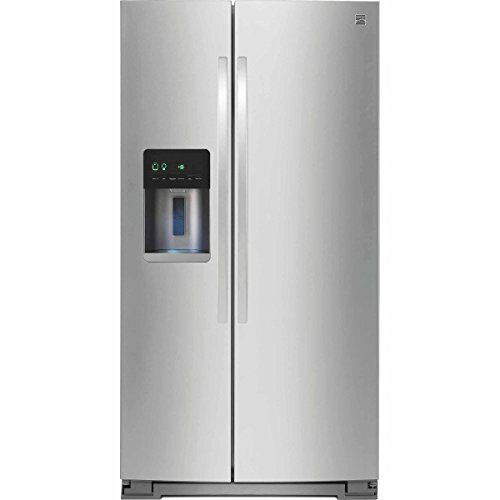 The fridge side on this model is slightly larger than the freezer side, which has a built-in ice and water dispenser on the door. A special charcoal filter system helps to remove odors so food stays fresher longer. Its compact, 33-inch width makes it ideal for use in a variety of kitchen spaces. Those who purchased and reviewed this side-by-side refrigerator appreciated that it had ample storage space for their needs, looked sleek, and had a quiet operation. There was mention that the ice/water dispenser couldn’t be used with taller cups, but that’s not necessarily a deal-breaker. At a cost of about $1,700, it doesn’t come cheap, but the quality craftsmanship associated with the brand, as well as the ease of setup and use more than justifies that price. It has a rating of 4.1 on Amazon with more than 60 people reviewing it, which we think goes a long way in convincing homeowners to make the investment. The Kenmore 50042 25 cu. ft. Side-by-Side Refrigerator is our pick for the best budget-friendly side-by-side refrigerator, coming in well under $1,000 yet still offering a 25 cubic foot capacity. The adjustable easy-to-clean glass shelves feature a spill-proof design, while the bright LED interior lighting makes it easy to find what you’re looking for. It includes a dairy shelf for added convenience. Those who purchased and reviewed this side-by-side refrigerator appreciated the amount of storage space this unit offered, and commented on how quiet the operation was. Some people were disappointed there wasn’t a deli drawer on this unit, but it’s a trade-off for such an affordable fridge. At a cost of around $800, this side-by-side refrigerator is a solid choice for those looking for a side-by-side refrigerator option on a budget. It has a rating of 4.0 on Amazon with more than 60 people reviewing it, which we think goes a long way in convincing homeowners that this budget-friendly pick is just as good at storing food safely as its more expensive counterparts. 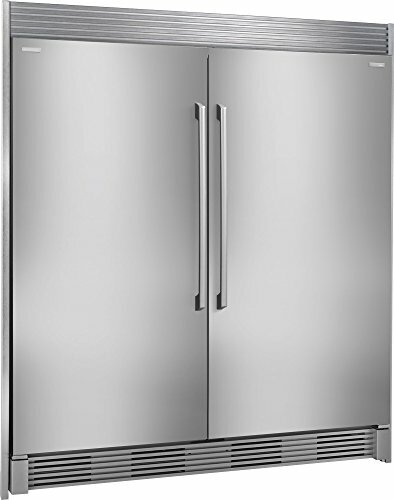 The Electrolux IQ Touch 32″ Built-in All Refrigerator & All Freezer is an excellent choice for those who want the most storage possible from their side-by-side refrigerator. This selection is actually two separate units packaged together in order to provide the most space and best performance possible, and is for built-in applications. It uses a specialized air filter in order to circulate air for adequate cooling, and prevent odor transfer. Those who purchased and reviewed this side-by-side refrigerator appreciated how stylish this looked in their kitchen, and said it was quiet while operating. Lighting was said to be bright, and configuring layouts was easy. With a price of around $5,000, it doesn’t come cheap, but the quality craftsmanship associated with the brand, as well as the amount of storage space offered more than justifies that price. It has a rating of 5.0 on Amazon with 2 people reviewing it, which we think helps to convince homeowners to consider making the investment if they want the most storage possible from their side-by-side refrigerator. The Kenmore 51783 20.6 cu. ft. Counter-Depth Side-by-Side Refrigerator is the best side-by-side refrigerator for small spaces, thanks to its counter-depth design, which reduces the amount of door swing clearance required. The gallon-sized adjustable door bins, dairy shelf, and integrated snack drawer help provide families with plenty of flexible storage options for their needs. It still provides 20.6 cubic feet of storage space, and uses a CleanFlow air filter system to remove odors while circulating fresh air throughout the fridge. Those who purchased and reviewed this side-by-side refrigerator appreciated that this fridge offered enough storage space for their needs, and that it included a full-width snack drawer — a feature not seen in a lot of other side-by-side fridges. At a price of about $1,300, it’s not overly expensive, and the quality craftsmanship associated with the brand, as well as the ability to have a side-by-side option in a small space more than justifies that price. It has a rating of 4.0 on Amazon with more than 60 people reviewing it, which we think goes a long way in convincing homeowners to make the investment. A side-by-side refrigerator is an ideal choice for those who want to have plenty of storage space for both fresh and frozen foods, with easy access to items. You can easily have your most-frequently used items at eye level, while more infrequent foodstuffs can be stored lower down. Their design also makes it easy to find items easily, as you aren’t digging through freezer drawers trying to find your foodstuffs. They can also be ideal for kitchens where space is a consideration, as their doors require less clearance space to swing open than a full-sized door on a traditional fridge with a freezer on top and fridge on the bottom. Since side-by-side refrigerators almost always include an ice and water dispenser in the door, they are a nice option for households where having easy access to cold, fresh water is desired. Width. Arguably the most important consideration when choosing a side-by-side refrigerator is the width of the unit, as you’ll want to make sure it will fit in your kitchen space. Measure carefully to avoid any disappointment, and ensure there is enough clearance for the doors to open and close fully. Capacity. The next most important consideration when shopping for a side-by-side refrigerator is the capacity. There are more compact models (around 15 cubic feet of storage) that are ideal for singles and two-person households, and there are other units with large storage capacity or 25 or more cubic feet. For most households, somewhere in the range of 20-22 cubic feet storage capacity should be enough to handle most needs. Price point. Finally, consider how much you are willing to spend on a side-by-side refrigerator. Side-by-side refrigerators vary in price from $7000-$1200 or more. You can frequently find discounts around the holidays such as Black Friday, or during year-end model clearouts that can make buying a side-by-side refrigerator more affordable. 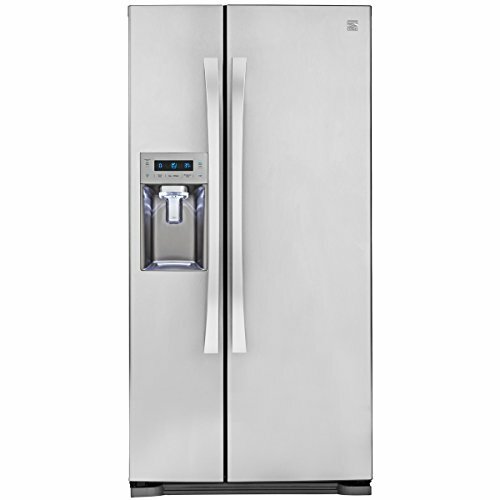 A side-by-side refrigerator is a fridge and freezer combination appliance which has the freezer portion on one side of the machine, and the fridge on the other. Some units keep the fridge and freezer side the same size, while others provide slightly more storage on the fridge side. Side-by-side refrigerators are a space-efficient option for smaller kitchen, with widths typically in the range of 33-36 inches. The narrower doors also require less space to swing open and shut. That said, their layout is such that the interior storage space is smaller than other models, and the tall, narrow compartments make it difficult to store wider items such as a pizza box. It can also mean that items stuck at the back are hard to find. The pros of a side-by-side refrigerator include the narrow doors, which require less space to swing open and shut, as well as their overall narrow footprint. Another benefit of a side-by-side refrigerators is that more frequently used items can be stored at eye level for easy reaching. Cons of a side-by-side refrigerator include the narrower fridge and freezer storage space. This means that wide deli trays, or even a large pizza box, won’t always fit. Because of this, you want to choose the widest model that will fit in your kitchen in order to maximize space. How much space does a side-by-side refrigerator require? A side-by-side refrigerator requires as much space as the fridge is wide, plus about two inches of clearance on either side so that the doors can fully open. The best way to know how much space a side-by-side refrigerator requires is to read the manufacturer’s product information sheet, as this typically contains all the information required for installation. We looked at 20 other side-by-side refrigerators. Even though they didn’t make our 5 best side-by-side refrigerators list, they’re the best of the rest and each is still a great option for your kitchen. The information you’ll need to compare each one is included with the listing. Cost information is based on Amazon pricing at the time of writing and is subject to change. This side-by-side refrigerator boasts a 25.4 cubic foot storage capacity, and includes two crisper drawers and a pantry drawer. This side-by-side refrigerator boasts an 18.6 cubic storage foot storage capacity in each unit, and has been specially-designed with built-in applications in mind. This side-by-side refrigerator boasts a generous 25 cubic foot storage capacity, and includes adjustable, easy-to-clean glass shelves for a variety of configurations. This side-by-side refrigerator boasts a large, 25.5 cubic foot storage capacity, and includes three humidity controlled crisper drawers along with a dairy drawer in the door. This side-by-side refrigerator boasts 21.9 cubic feet of storage capacity, and features a unique GeniusCool technology that helps to circulate air better for fresher, longer-lasting food. This side-by-side refrigerator boasts a generous 25 cubic foot storage capacity, and uses adjustable shelves and bins with a TuckAway shelf for plenty of layout options. There’s even a Pizza Pocket ideal for storing frozen pizzas. This side-by-side refrigerator boasts a massive 29.5 cubic foot storage capacity that’s perfect for even the hungriest households. The unique temperature management system helps to keep foods fresher longer. This side-by-side refrigerator boasts a 25.6 cubic foot storage capacity, and uses an improved freezer design to provide more storage capacity for items like frozen pizzas. This side-by-side refrigerator boasts a 24.5 cubic foot storage capacity, and includes a control lockout pad and full-width wire freezer shelves. This side-by-side refrigerator boasts a 25.4 cubic foot storage capacity, and features bright LED interior lighting and adjustable spill-proof glass shelves to keep groceries organized and easy to access. This side-by-side refrigerator boasts a 28 cubic foot storage capacity, and features a Freshflow air filter and ACCU-CHILL temperature management system to keep food fresh and tasting its best. This side-by-side refrigerator boasts a 25 cubic foot storage capacity, and uses a ExtendFresh Plus system to help keep food fresh and tasting its best. The crisper drawers slide easily thanks to the SatinGlide system. This side-by-side refrigerator boasts 26 cubic feet of storage space, and features gallon-sized door bins that are strong enough to hold jugs and bottles in the door. This side-by-side refrigerator boasts a 21.5 cubic foot storage capacity, and includes smart features like a door open alarm, high efficiency LED lighting, and power freeze and cool options. This side-by-side refrigerator boasts 21 cubic feet of storage space, and features plenty of flexible storage options for any household’s needs. This side-by-side refrigerator offers 22.7 cubic feet of storage space combined with a counter-depth design that makes it ideal for installation in kitchens where space is at a premium. This side-by-side refrigerator boasts 21.7 cubic feet of storage space, and comes complete with two crisper drawers. Door-in-door design means less energy when grabbing certain items. This side-by-side refrigerator boasts 21.9 cubic feet of storage space, and features a unique temperature management system to help keep foods fresher, longer. This side-by-side refrigerator boasts 22 cubic feet of storage capacity, and comes complete with three spill-proof shelves and two humidity controlled crisper drawers. This side-by-side refrigerator offers 21.7 cubic feet of storage space, and uses a smart cooling system to help maintain the ideal storage conditions for your foodstuffs.